Annex 66 was officially closed on June 21, 2018 at the 83rd IEA EBC ExCo meeting in Stockholm, Sweden. Studying occupant behavior in buildings: methods and challenges, ISBN 978-0-9996964-0-8. An international survey of occupant behavior in workspaces, ISBN 978-0-9996964-3-9. Occupant behavior modeling approaches and evaluation, ISBN 978-0-9996964-1-5. Surveys to understand current needs, practice and capabilities of occupant modeling in building simulation, ISBN 978-0-9996964-2-2. Occupant behavior case study sourcebook, ISBN 978-0-9996964-4-6.
obXML, an XML schema to standardize the representation and exchange of occupant behavior models for building performance simulation. obXML builds upon the DNAS ontology. A library of obXML files, representing typical energy-related occupant behavior in buildings, has been developed. These obXML files can be exchanged between different BPS programs, different applications, and different users. obFMU, a modular software component in the form of functional mockup units enabling co-simulations with BPS programs using the standard functional mockup interface. obFMU reads occupant behavior models represented in obXML and functions as a solver. Occupancy Simulator, a web-based application to simulate occupant presence and movement in buildings using stochastic models. This tool generates sub-hourly occupant schedules for each space and individual occupants in CSV files, which can be used for building performance simulations. In late September 2017, the OB-17 Symposium and the 6th IEA EBC Annex 66 Experts Meeting were hosted by Building Energy Research Center (BERC) at Tsinghua University in Beijing. More than 60 participants from 14 countries attended this meeting and shared their knowledge on occupant behavior research. The 6th Experts Meeting is the final meeting of Annex66. The overall project progress and achievements were summarized at the meeting. The Operating Agents, Prof. Da Yan from Tsinghua University and Dr. Tianzhen Hong from Lawrence Berkeley National Laboratory, led the discussion on the final report of Annex 66. Potential topics of a new annex were also discussed and led by Prof. Andreas Wagner of KIT, Germany and Dr. Liam O’Brien of Carleton University, Canada. During the dinner on 26th September, there is an award ceremony to thank 21 participants for their services to Annex 66 during the four years. The three-day event ended with a technical tour of two famous modern buildings in Beijing, the national center for the performing arts (NCPA) and the phoenix international media center. Most participants joined this tour and enjoyed a nice afternoon. On May 17, 2017, The International Centre for Indoor Environment and Energy (ICIEE) at the Technical University of Denmark hosted the OB-17 Symposium on Occupant Behaviour and Adaptive Thermal Comfort. OB-17 was the third international symposium focusing on monitoring, modelling, and manipulating occupant behaviour and the energy and comfort consequences of these behaviours. It brought researchers from Annex 69 and Annex 66 together to share recent research, technological developments and best practices on the understanding and influence of adaptive thermal comfort and occupant behaviour in buildings. 70 researchers and practitioners from 17 countries and 5 continents, from broad backgrounds (engineering, architecture, psychology, sociology, etc.) participated. OB-17 aimed to stimulate discussions and debate on adaptive thermal comfort and occupant behaviour. The symposium followed a two-day Annex 69 expert meeting on adaptive thermal comfort and, was followed by a two-day Annex 66 meeting on Modelling of Occupant behaviour in buildings. Both meetings were hosted by ICIEE at the Technical University of Denmark. It was a great pleasure and honour to host many of the world’s leading experts on thermal comfort and occupant behaviour. In my opinion, the breadth and depth of the presentations and discussions was very encouraging and inspiring. The final symposium program including abstracts of the presentations is available here and the presentations and posters are available here. In early August 2016, Professor Liam O'Brien hosted a group of leading academic and industry experts on occupant behavior research from 14 countries (i.e. Australia, Austria, Canada, China, Denmark, France, Germany, Hong Kong, Italy, Japan, Norway, the Netherlands, UK, and USA) at Carleton University in Ottawa Canada, for the 4th IEA EBC Annex 66 Experts' Meeting and the second international occupant behavior symposium (OB-16). The first day of the three-day event started by four keynote talk in the morning, followed by the OB-16 symposium where 21 researchers and practitioners presented their latest work on various themes of occupant behavior research. Among the keynotes, the CEO of Ecobee, Stuart Lombard, discussed the sharing of occupant behaviour data with researchers. Isis Bennet of Carleton University and Brandon Malleck of Bentall Kennedy presented on the challenges of motivating occupants to reduce plug loads. During the next two days of the Ottawa meeting, the subtask leaders reported and discussed the overview of activities in each subtask. The arranged break-out sessions and panel discussions for each subtask allowed participants to present and discuss about the work plan for deliverables of each subtask in more details. The contributors to the Annex 66 exchanged their ideas on the outline of the final Annex 66 report. The potential for future international multi-disciplinary collaboration under a new Annex with focus on the applications of the Annex 66 outcomes was also discussed. The three-day Ottawa event ended with a technical tour of the CHEeR House on campus, a research project led by Professor Ian Beausoleil-Morrison at Carleton University. The participants enjoyed the natural beauty and built history of Ottawa. Finally, Liam O’Brien handed over hosting duties to the host of the next meeting in Copenhagen, Rune Andersen. The IEA-EBC Annex 66 3rd expert meeting in the working phase was hosted by Professor Ardeshir Mahdavi, Department of Building Physics and Building Ecology at TU Wien, Vienna, Austria. The three-day meeting took place from March 30 to April 1, 2016. More than 60 participants from 22 countries (namely, Austria, Belgium, Canada, Czech Republic, China, Denmark, France, Germany, Hong Kong, Hungary, Italia, Japan, Netherlands, New Zealand, Norway, Poland, Singapore, South Korea, Switzerland, Turkey, UK, and USA) attended the meeting. The first day of the meeting was allocated to an International Symposium on People's Behavior in Buildings, with 3 keynote speakers in the morning and two PhD presentation sessions in the afternoon. Altogether, 16 doctoral students presented the latest result of their occupancy-related research work. In the following two days, Annex 66 participants reported on the progress of activities within Subtasks A to E. Panel discussions, structured sub-task breakout sessions, working lunch meetings, and informal encounters provided ample opportunities to discuss progress to-date and project future steps. The meeting benefited from the prevailing good weather and the rich backdrop of the historical city of Vienna. At the ASHRAE conference in Orlando in January 2016, ASHRAE approved a new multi-disciplinary task group on occupant behavior in buildings (MTG.OBB). The MTG will coordinate TC/TG/TRG technical activities to help implement the recommendations from this MTG. This includes coordinating efforts in education, modeling, research, standards, marketing, advocacy, and fund raising within ASHRAE. Research project initiation as the sponsoring committee is included in the scope of this MTG. MTG.OBB is concerned with understanding occupant behavior in buildings and meeting individual needs of indoor environmental quality (IAQ, thermal, visual and acoustic comfort), health, productivity, as well as improving occupant interactions with building energy and control systems to reduce energy use. MTG.OBB will sponsor and coordinate activities of related ASHRAE technical and standards committees to facilitate development of data, tools, technologies, and guidelines enabling integration of occupant behavior in the design, operation, and retrofit of new and existing commercial and residential buildings. The intent is that these products, focusing on the human dimension, may be used in the life cycle of buildings and potentially contribute to ASHRAE’s energy saving targets, by demonstrations of behavior-driven passive and active building designs and identification of energy saving opportunities from behavior measures. Within ASHRAE, the MTG will coordinate activities to update related parts of ASHRAE Handbooks and Standards (particularly energy and indoor environmental calculations, standards 55, 62.1, 62.2, 90.1, 90.2 and 189.1), and to develop related education programs for buildings designers, operators and occupants. Outside of ASHRAE, the MTG will monitor related activities (e.g. IEA EBC Annex 66) and represent ASHRAE interests where permitted to provide a conduit for related information transfer to ASHRAE members. Individuals and parties interested in joining the MTG, please contact Chair Dr. Tianzhen Hong (thong@lbl.gov) or Vice Chair Dr. Da Yan(yanda@tsinghua.edu.cn). The committee will meet at the ASHRAE St. Luis conference in June 2016. 1st announcement of 2016 International Workshop on Implications of Occupant Behavior for Building Operation and Design: Now and the Future. We are pleased to announce a one day Workshop on Implications of Occupant Behavior for Building Operation and Design: Now and the Future. This workshop is primarily sponsored by U.S. National Science Foundation. The objective of this workshop is to identify the research gaps in existing occupancy behavior research including what the obstacles are and what is needed from both U.S. NSF and industry, and the identification of future research directions. There are three major topics/panels: (1) Topic 1: Modeling and simulation of occupancy presence in buildings; (2) Topic 2: Human building interactions; (3) Topic 3: Occupancy behavior based applications in industry. Each panel will have three speakers. After each panel, there will be 1 hour panel discussion on that specific topic. Registration will open soon and seats are very limited. On March 30, 2016, we are hosting an International Symposium at TU Wien regarding people's behavior in buildings. This symposium will be held in conjunction with the Annex 66 3rd expert meeting in Vienna, Austria (March 31st to April 1st 2016). The main purpose of this Symposium is to provide a platform for PhD candidates to present their ongoing or recently completed work in the area of human occupancy and behavior in buildings. Toward this end, we invite interested PhD candidates working on related topics to submit an abstract. Please send your abstracts (maximum 300 words in word or pdf) to farhang.tahmasebi@tuwien.ac.at. Deadline for abstract submission is January, 30th 2016. The authors should also provide their full name, email address, academic institution, and academic supervisor. The authors of the selected abstracts will have the opportunity to personally present their work at the symposium and interact with the members of the Annex 66 community. We appreciate if you would forward this announcement to PhD-candidates who might not be on this mailing list. We are looking forward to your abstracts and to meet you all here in Vienna. The goal of this brief anonymous 38-question survey, aimed at practitioners (architects, engineers, other building modellers), is to inform researchers and software tool developers of current practices and attitudes about occupant modelling. Researchers are welcome to participate, but their responses may not be used in this study. The results will be securely and anonymously stored. Your information will not be shared with anyone. A summary of the aggregate results will be publicly released in approximately Summer 2016. · 2 copies of the book “Modeling, Design, and Optimization of Net-Zero Energy Buildings” edited by Andreas Athienitis and William O’Brien. 396 pages. Thank for your time, in advance. This short survey is being run by researchers of the International Energy Agency - Energy in Buildings and Communities (IEA EBC) Programme Annex 66: “Definition and Simulation of Occupant Behavior in Buildings”. If you have any questions or concerns, please feel free to contact Dr. Liam O'Brien (Liam.OBrien@carleton.ca). This research was approved by the Carleton University Research Ethics Board-B, Project # 15-162. Please check out the July 2015 Annex 66 Newsletter. We would like to say a special thank you to Quentin Darakdjian for translating the newletter into French (Newsletter in French) and Sebastian Wolf for translating the newsletter into German (Newsletter in German). The second Expert Meeting was successfully concluded in KIT, Karlsruhe, Germany. The three-day meeting took place August 3 to 5, 2015. 60 participants from 14 countries attended the two-day Annex 66 meetings. Many activities made significant progress. Three cross-task research topics, behavioral data collection and database, social and behavioral influencing factors, and behavior model evaluation and application, were discussed among all participants. Two special journal issues of Energy and Buildings are being managed by Tianzhen Hong, Andreas Wagner, and Bing Dong, with 34 articles submitted on the research area of occupant behavior in buildings. Participants visited KIT's facility LOBSTER, Laboratory for Occupant Behavior, Satisfaction, Thermal comfort and Environmental Research. After highly successful preparation phase meetings in Hong Kong and Great Britain, the International Energy Agency/Energy in Buildings and Communities Programme (IEA EBC) Annex 66 formally met again on March 30, 31 and April 1 2015 at LBNL in Berkeley, CA, USA. Annex 66 is composed of a group of about 90 researchers from around the world who specialize in the technical aspects of occupant behavior in buildings. The three-day event, included an International Technical Forum, a symposium that allowed leading researchers to present their latest work, followed by two-days of annex meetings to discuss research progress and plans. The International Technical Forum included a kick-off introduction by LBNL Staff Scientist, Richard Diamond and co-operating agents, Tianzhen Hong and Da Yan. This was followed by a Department of Energy (DOE) panel on “Envisioning future occupants: A discussion panel for the DOE Buildings of the Future project” and a moderated session entitled “What role might the US government play in supporting occupant behavior research?” This was followed by 8 invited oral presentations from presenters in industry and academia, including engineering and social sciences and from the US, Japan, Germany and Austria. Major categories of topics included occupant modelling approaches, comfort studies, occupant behavior implementation strategies, and case studies. A second annual Symposium on Occupant Behavior, (OB-15) is planned to take place in Germany in August of 2015 in conjunction with the Annex 66 Second Experts Meeting of Working Phase. Following the International Technical Forum, 72 Annex 66 researchers, from 16 countries (i.e. the Netherlands, USA, Denmark, Hungary, Norway, China, UK, France, Italy, Canada, Austria, Portugal, New Zealand, Germany, Japan, and Brazil) met for an intensive two-day meeting. This was the first meeting in which all the subtask leaders were in attendance. On the first day of the Annex meetings, 34 short presentations were given including overviews of the progress of each subtask and presentations on each activity which will contribute to the final report. On the second day five subtasks (A: Occupancy; B: Residential Buildings, C: Commercial Buildings; D: Modeling Tools; and, E: Applications) met in break-out sessions. During the break-out sessions, researchers presented on work applicable to the subtask topic. In addition, discussions on the current status of the field and challenges were addresses. In several cases, Annex participants have arranged to work across subtasks on different activities, with the subtask leaders acting as mainly champions for activity completion. The activities include documentation and standards on data collection, modelling methodologies, and model verification. Other ongoing activities within Annex 66 include: the development of an occupant behavior data repository and outreach and dissemination to the research and construction communities through workshops and conferences. Following Prof. Ardeshir Mahdavi's Annex 66 talk in Berkeley, California many participants requested a related publication. The proceedings of the BSA 2015 conference have been posted (link), with Prof. Mahdavi's keynote including many of the main points of his Annex 66 talk. Citation: Marco Baratieri, Vincenzo Corrado, Andrea Gasparella, Francesco Patuzzi (editors), Building Simulation Applications BSA 2015. 2nd IBPSA-Italy conference, Bozen-Bolzano 4th-6th February 2015. The presentations from all three days can be downloaded, by logging into the Annex 66 website. Once logged in, the presentations are located under documents with the link “First Expert Meeting in Working Phase: March 31, 2015 Berkeley.” Alternatively, the files can be found on dropbox. Any issues with this process please contact Sarah Taylor-Lange at (sctaylorlange@lbl.gov). Additional experts are encouraged to participate in Annex 66 by first contacting the operating agents (Da Yan and Tianzhen Hong). The fourth of eight biannual Experts Meetings will be hosted by Prof. Andreas Wagner from KIT, at Karlsruhe, Germany on August 3 to 5, 2015. More information on Annex 66 can be found at www.Annex66.org. The second Annex 66 Expert Meeting of Working Phase will be hosted by Prof. Andreas Wagner at KIT, Germany during August 3 to 5, 2015. Details of the meetings are available at the following flyer. The DTU organizes a summer school on Dynamic Methods For Whole Building Energy Assessment 22 - 26 June 2015. Henrik Madsen is one of the organizers. The summer school is highly relevant for our work in the Annex 66. Its main purpose is to train the students in a methodology for evaluation of measured data. Statistical modelling methods for using such time series data are discussed to assess valuable information about the energy performance of a building or the building element. The Summer School will take place at the campus of DTU in Lyngby, Denmark. Submission deadline is 15 May 2015.
focuses its activities on finding solutions that will enhance University resilience, to adapt to major shifts in the environment, economy, and social matters. Thanks to the funding for the internationalisation of research provided by Compagnia di San Paolo, the Politecnico di Torino and the University of Cambridge are being able to carry on a project, namely politoward, which aims at fostering international academic collaboration on the theme of Campus Sustainability. Politoward Summer School provides to all interested researchers an unique opportunity to deal with sustainability-related issues in a theoretical and, above all, practical way. The registration for the three-day Annex 66 meetings is now open. Please go to the Register tab for more information and registeration. Dr. Tianzhen Hong presented the progress of Annex 66 during the one-year preparation phase, at the 76th IEA EBC Executive Committee Meeting on November 6, 2014 in Helsinki, Finland. The EBC Executive Committee voted (100% yes vote) to approve the start of three-year working phase of Annex 66. After a highly successful First Experts? ?meeting in Hong Kong, IEA EBC Annex 66, a group of about 90 researchers from around the world who specialize in the technical aspects of occupant behavior in buildings, formally met again in August 2014 for a second time at the University of Nottingham in Nottingham, UK. The three day event, included OB-14, a symposium that allowed leading researchers to present their latest work, followed by a two-day meeting to discuss research progress and plans of the Annex. The OB-14 Symposium included 14 oral presentations and about a dozen poster presentations on a variety of occupant behavior-related topics. Major categories of topics included occupant modelling approaches, comfort studies, occupant behavior implementation strategies, and case studies. Professor Henrik Madsen, a world-renowned expert in mathematical modelled of energy systems and buildings, provided a keynote speech, Crystal ball techniques: Illustrating the power of statistical modelling, to the audience in the beautiful Keighton Autidorium. The second annual Symposium on Occupant Behavior is tentatively planned to take place in Germany in the summer of 2015 in conjunction with the fourth experts meeting of Annex 66. Following the presentations, the five subtasks (A: Occupancy; B: Residential Buildings, C: Commercial Buildings; D: Implementation of occupant behavior in simulation; and, E: Applications of occupant behavior models) met in break-out sessions. They discussed current status of the field, challenges, and assigned research tasks. In several cases, Annex participants have arranged to work across subtasks to develop methodological documents. These include documentation and standards on data collection, modelling methodologies, and model verification. Other ongoing activities within Annex 66 include: the development of an occupant behavior data repository and outreach and dissemination to the research and construction communities through workshops and conferences. Additional experts, particularly software developers from industry, are encouraged to participate in Annex 66 by first contacting the operating agents (Da Yan and Tianzhen Hong). The third of eight biannual Experts Meetings will be hosted by Dr. Tianzhen Hong at Lawrence Berkeley National Laboratory (LBNL) in Berkeley (near San Francisco, California), USA on March 30 to April 1, 2015. More information on Annex 66 can be found at www.Annex66.org. Technologies alone do not guarantee low energy buildings. Occupant behavior plays an essential role in the design and operation of buildings, but it is quite often oversimplified. Occupant behavior refers to an occupant's movement and responses to discomfort, when his/her comfort needs are not met. Occupant behavior varies with time, space and individual, and is influenced by social context. It is random, complex and multidisciplinary. Having a better understanding and robust modeling of occupant behavior in buildings can improve the accuracy of building simulations and guide the design and operation of buildings. A seminar (Seminar 15, sponsored by TC 4.7 Energy Calculations and TC 2.1 Physiology and Human Environment) was organized on June 30, 2014 during the ASHRAE Conference in Seattle. About 100 people attended the seminar and many expressed strong interest in participating in or being kept informed of the Annex 66 activities. Dr. Da Yan from Tsinghua University, China presented an overview of IEA EBC Annex 66, Definition and Simulation of Occupant Behavior in Buildings. Annex 66 aims to tackle fundamental issues of occupant behavior research focusing on: behavior data collection, behavior model development, model validation, and applications to improve building design, operation, and retrofit to reduce energy use. Annex 66 attracts more than 50 institutes from 22 countries. More information is available at annex66.org. Prof. Clinton J. Andrews, from the State University of New Jersey, presented agent-based modeling of occupant behavior. This presentation shares a simulation model that incorporates occupant behavior as an integral component of a building's performance dynamics. It couples an agent-based model of occupants? ?adaptive responses to comfort conditions, calibrated with behavioral observations and survey data, to a detailed EnergyPlus model of a commercial building. It applies this framework in two situations: (1) assessing the behavioral robustness of alternative building system designs, and (2) fine-tuning the operational strategy for an existing building given a desire to balance comfort and energy efficiency. The agent-based simulation framework implements a Belief-Desire-Intention model of human decision making that includes organizational considerations. Prof. Bjarne W. Olesen, from Technical University of Denmark, presented an overview of occupant behavior research at the Technical University of Denmark. Second conference call with subtask leaders took place on 6/30/2014. The call focused on preparation for the Nottingham meeting as well as progress of each subtask. An agreement was reached to focus on four key challenges of behavior research: data collection, model development, model validation, and applications to reduce energy use in buildings. Dr. Da Yan reported the progress of Annex 66 to the Executive Committee of IEA EBC on June 11, 2014. Dr. Tianzhen Hong introduced Annex 66 and behavior research at LBNL to IBPSA San Francisco Bay Area Chapter on June 10, 2014. About 40 building designers, engineers, and energy modelers attended the June Event. It is well-established in the building simulation community that occupant behaviour represents one of the greatest impacts on building performance. An international collaborative effort is needed to set up a scientific framework of occupant behavior simulation and definition. IEA EBC Annex 66, the first Annex to focus exclusively on occupant behavior simulation, had its first Open Forum and Experts Meeting on March 12 to 14 in Taikoo Place in Hong Kong. The purpose of the meeting was to solidify the objectives of the Annex and to develop a detailed work plan. In total, 39 researchers and industry professionals from 13 countries attended the three-day meeting. Annex 66, titled Definition and Simulation of Occupant Behavior in Buildings has set out the mandate to support more accurate building design and operation through the standardization of occupant monitoring, modelling, and simulation. The Annex is led by Dr. Da Yan of Tsinghua University and Dr. Tianzhen Hong of Lawrence Berkeley National Laboratory, the Operating and Co-operating Agents. It is further divided into five subtasks as outlined in Figure 1. Three parallel subtasks are working on occupancy (presence and movement), residential building occupants, and commercial building occupants modelling. The three subtasks have also joined forces to establish standard protocols for occupant monitoring (e.g., sensing and experimental design) and modelling approaches. Furthermore, they are establishing a database of high-quality monitored occupant behaviour data that will be open to other researchers. Subtask D is focused on developing methods to implement occupant behaviour models into established simulation engines so that they can be more accessible to researchers, designers, and facilities managers. Finally, Subtask E is focused on demonstrating the value in occupant behaviour modelling through applications such as improved building design and operation. In all, the Annex is currently represented by 23 countries, 57 institutions, and 90 experts. Additional experts, particularly software developers from industry, are encouraged to participate in Annex 66. Annex 66 Seeks to Standardize Studies of Occupant Behavior. The second Experts Meeting of Annex 66 will be hosted by Professor Darren Robinson at the University of Nottingham in the UK on August 4-6, 2014. The first Expert Meeting of the Annex 66 in Preparation Phase will take place on March 13 and 14, 2014 in Hong Kong. There will be an optional half-day technical forum on March 12. Official announcement and invitation letter were sent out on Jan. 15, 2014. First conference call with subtask leaders took place on 12/14/2013, which focused on discussing scope of work and planning for the first Expert meeting in Hong Kong in February or March 2014 (exact dates to be confirmed soon). The full proposal of Annex 66 was approved at the 74th IEA EBC Executive Committee meeting on November 14, 2013 in Dublin, Ireland. Annex 66 is now officially launched. 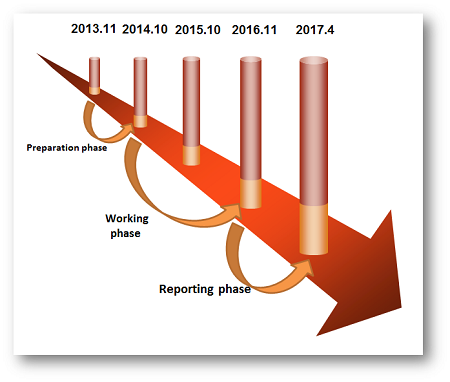 The Annex will have three phases: 1) Preparation Phase, one year from November 2013 to October 2014, 2) Working Phase, two years from November 2014 to October 2016, and 3) Reporting Phase, half a year from November 2016 to April 2017.